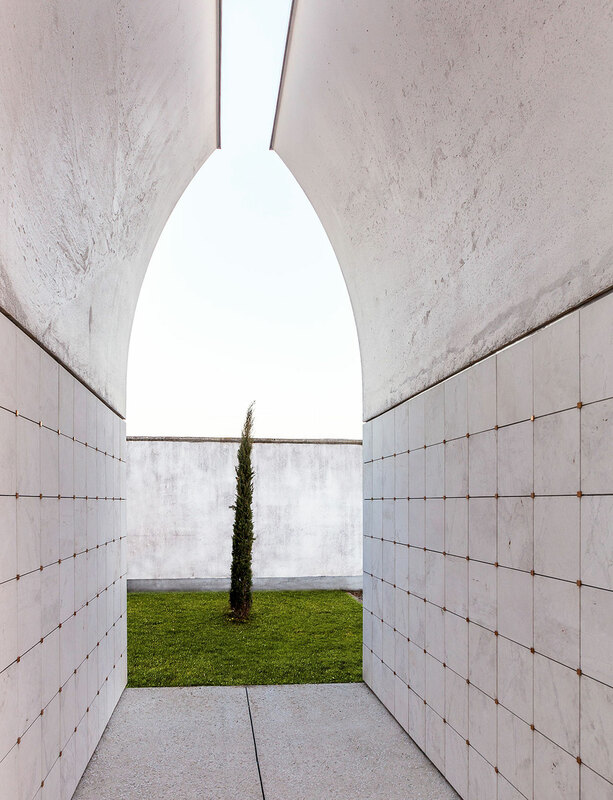 Eschewing the drab and grandiose design of traditional memorial buildings, the new funerary pavilion at the cemetery of Dalmine, a small municipality in northern Italy, turns inwards to create a quiet space of elegiac simplicity and extemporaneous introspection. 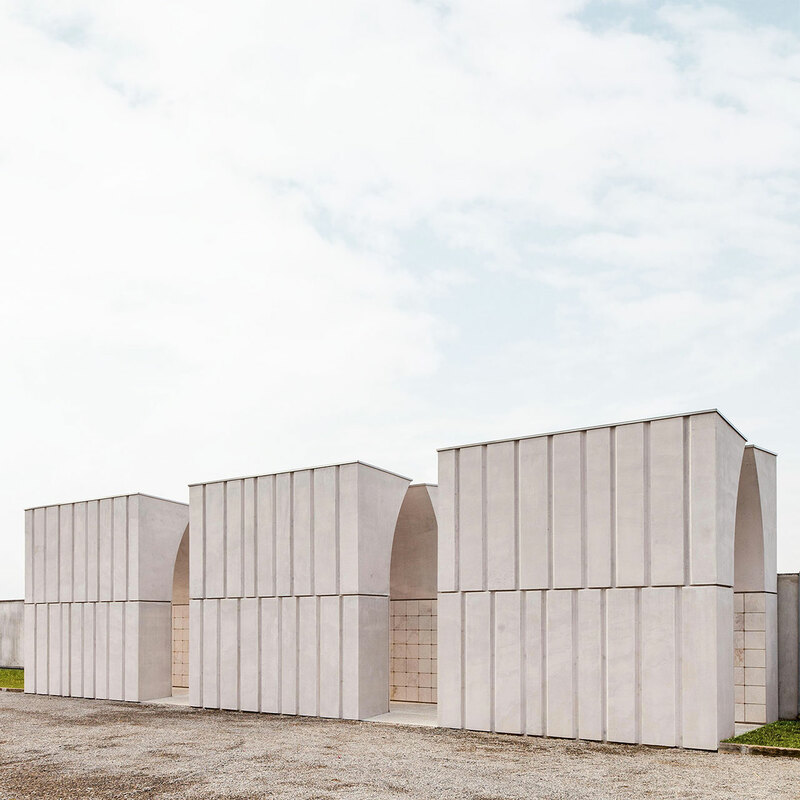 Commissioned to design a mausoleum to host an additional 500 niches for ossuaries and cinerary urns, Bergamo-based practice CN10 ARCHITETTI decided to move away from the existing typology —usually a colonnaded, monolithic structure that is open to the cemetery grounds— for a more sculptural and introverted approach. 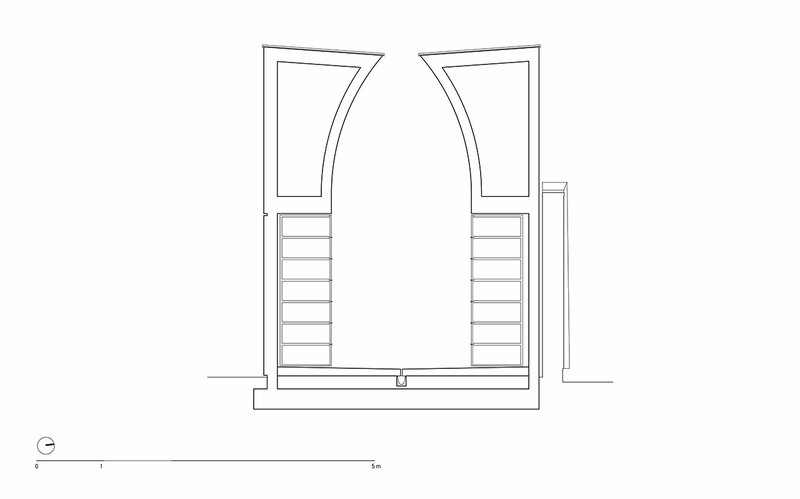 Designed as three separate yet perfectly aligned volumes, their cubic appearance belies a two-piece, arched construction that creates an internal passage traversing all three blocks. 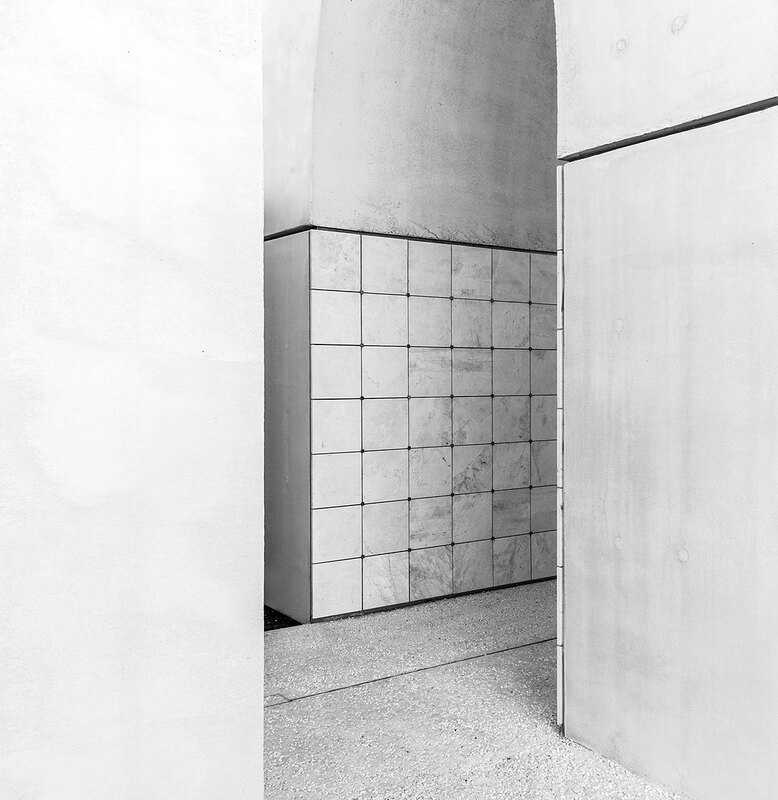 It is here, in the interstices between the flanking arches, where the niches are placed: a curved-out space that isolates the visitors from the rest of the grounds, creating an intimate and meditative environment. 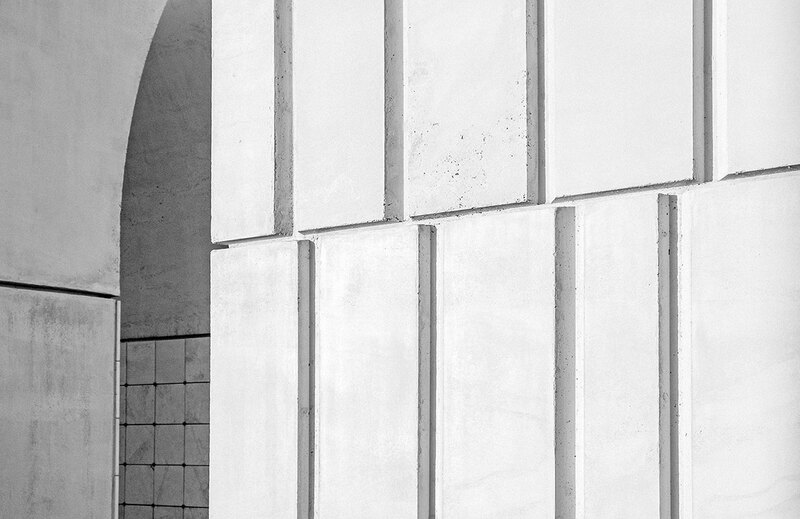 Crowning the arches, a narrow gap that mirrors the processional pathway along which the visitors move, allows sunlight to enter the space without diluting the sense of privacy and seclusion, while the internal curvature of the roof protects the niches from the rain. 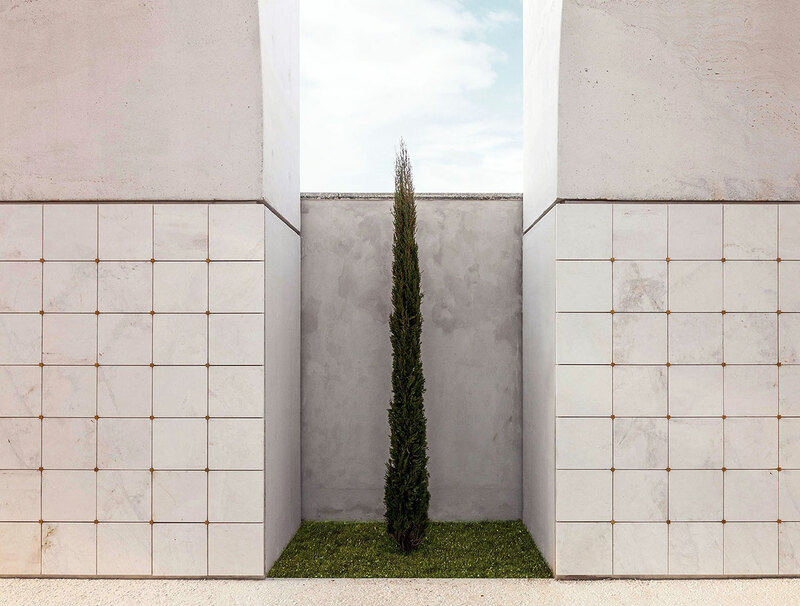 Cypresses planted between the blocks, enhance this meditative sense providing a visual break from all the hard surfaces while also alluding to the cycle of life. 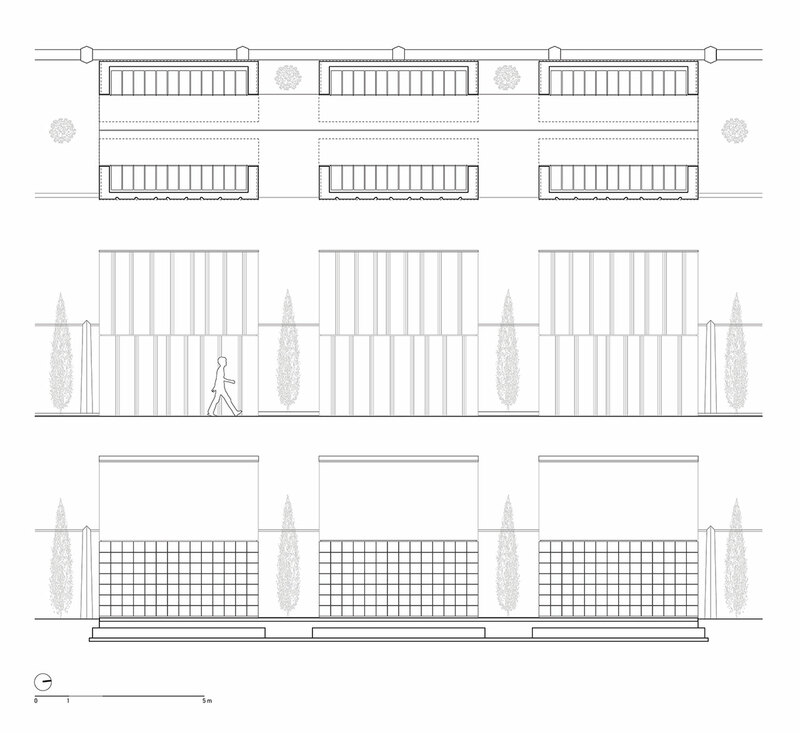 Prospects and sections © CN10ARCHITETTI. 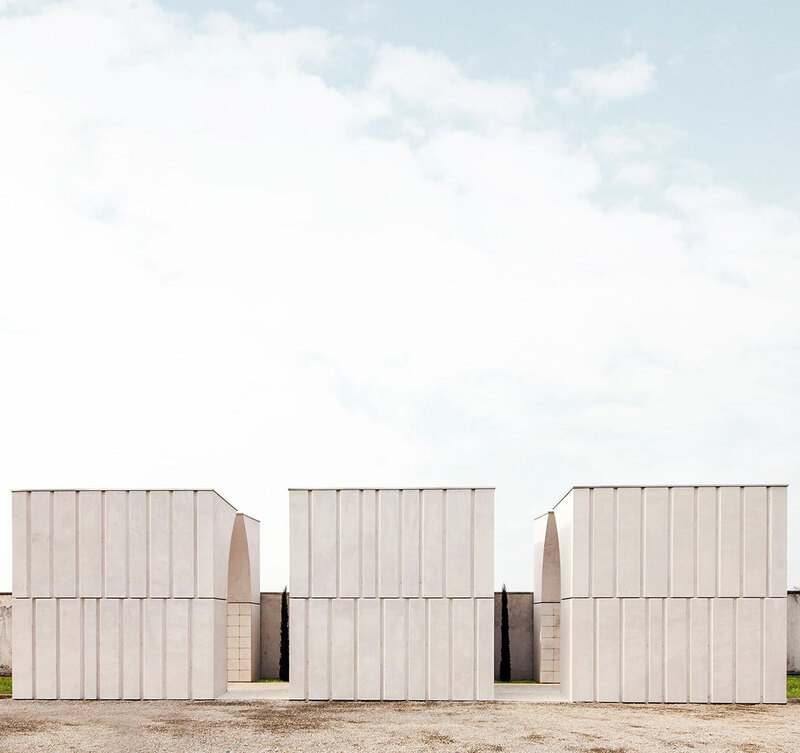 The three concrete blocks share the same scale and off-white finish with the other buildings in the cemetery, while the niches, made from Zandobbio marble, mirror the shape and aesthetics of the existing amenities. 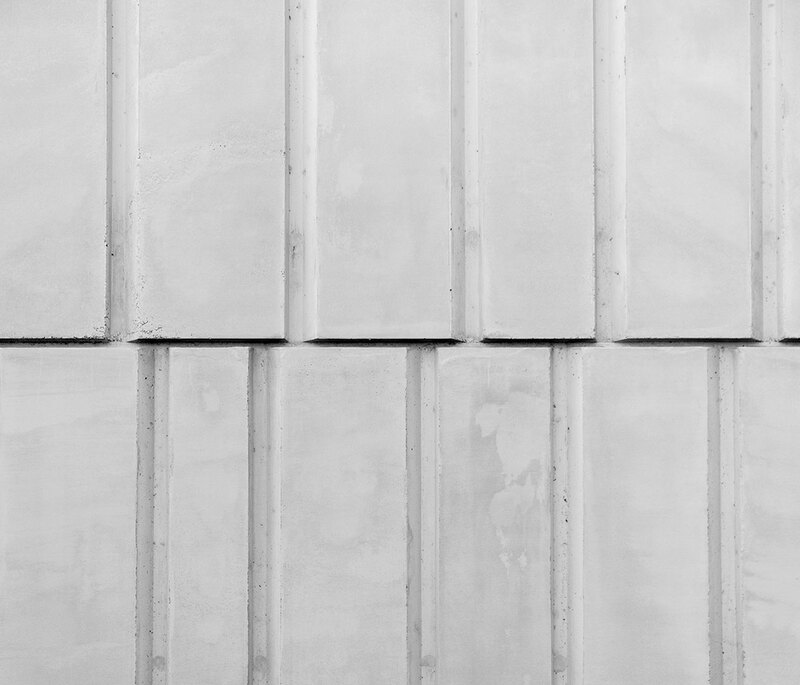 The striated treatment of the exterior elevations also pick up the verticality of the colonnade of the adjacent structure and the perimeter wall pillars albeit while possessing a more abstract decorative quality that transforms the pavilion into a sculptural conduit of remembrance. 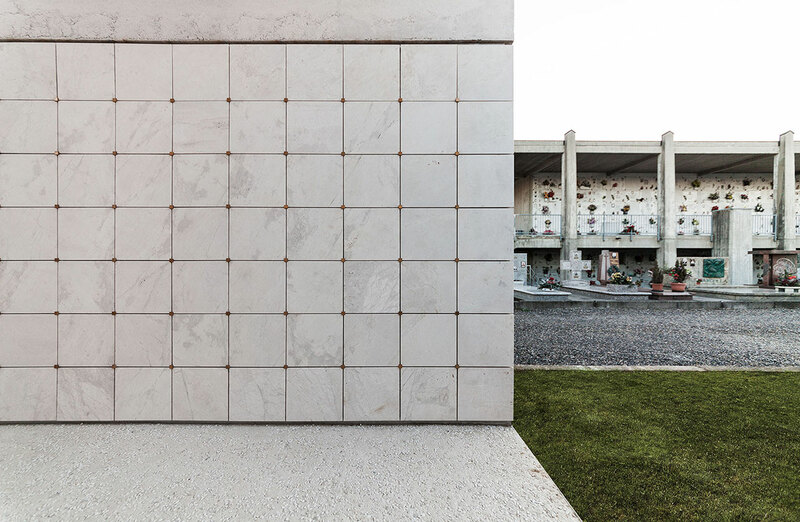 Although the sanctuary lacks any overt religious iconography, the internal space is, in effect, an extrusion of two crosses imbuing a symbolic sacredness while allowing mourners a clean slate to pay their respects and conjure memories. 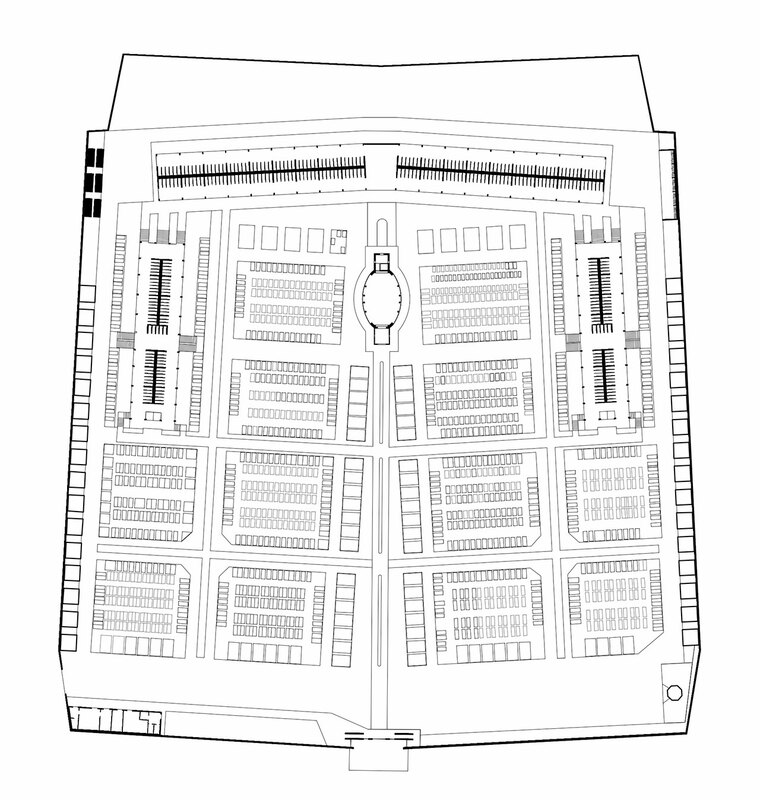 The design also allows for future expansion since, as the architects explain, "the three blocks define a serial and unitarian system, which can be repeated infinitely", which is indeed a comforting possibility vis-à-vis life’s precious brevity.